YESSS! We’re so glad you’re here and want to become a member of about 650 other young folks with class privilege and/or wealth who are committed to racial, economic, and social justice! JUMP DOWN TO OUR MEMBERSHIP FORM HERE. LET’S GET STARTED. SO, WHY SHOULD YOU BE A MEMBER? We believe that people who have benefitted from our deeply unjust economic system have a role to play in challenging its future by supporting Resource Generation and the social justice movement, especially now as we’re living through the richest presidential administration in modern history and unprecedented wealth inequality. We believe in the power and necessity of getting our own people to become politicized and organized: The labor of political education, training, and organizing people with privilege should not fall to those who have been most harmed by systems of oppression. Nor should our work of organizing young people with wealth compete with their funding opportunities. Although the vast majority of wealthy people are white, we are committed to multiracial base-building because young people of color must reclaim our stories and tell the truth about why, though our families worked hard to succeed, a meritocracy will never lift all of our people up. People of colors’ success stories will not be used to justify an economic system that exploits poor and work-class people of all races. We believe that mass movements of poor and working-class people and people of color create systemic change, and that privileged people can aid and fuel those movements as an RG member by leveraging the wealth, resources, power, stories, and networks we have access to. We believe that we need to counter the way class privilege and wealth reinforces individualism: We organize to center the good of the collective, to bring people out of individual guilt or isolation, and into collective power and action by sharing our money and time. ALRIGHT, SOUNDS COOL. BUT WHAT DO YOU GET? A unique multiracial community of people grappling with how to show up meaningfully for social justice that you’ll connect with online and in-person. Tools to hold you accountable to leveraging your access to wealth to meaningfully advance the organizing work of movements led by poor and working-class communities fighting for economic and racial justice. Reduced rates to our workshops, webinars, and conferences like Making Money Make Change (the national conference our members and people 18-35 years old who care about social justice), and Transforming Philanthropy (a biannual conference for people 18-35 years old who are involved in philanthropy, have access to high net wealth, or have a family foundation). 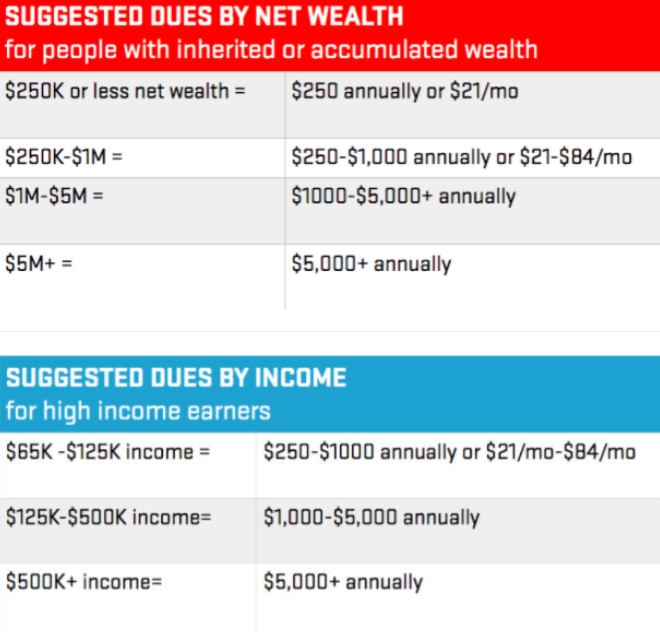 Tools for navigating class, money and wealth. And you get a free copy of one of our RG publications with membership. For example, we have a few books, like Classified: How to Stop Hiding Your Class Privilege and Use it for Social Change and Between A Silver Spoon and the Struggle: Living at the Intersection of Racism and Class Privilege. Invitations to our leadership development programs such as Praxis groups, all-member conference calls, chapter events, retreats, media training, and campaign actions and planning. Access to member-only areas like our private membership Facebook group and regional and issue-specific national listservs (Google groups). Discounted rates for events and publications from our partner organizations when available. WHY AGAIN SHOULD YOU, A RICH PERSON, FUND AN ORGANIZATION OF YOUNG RICH PEOPLE? 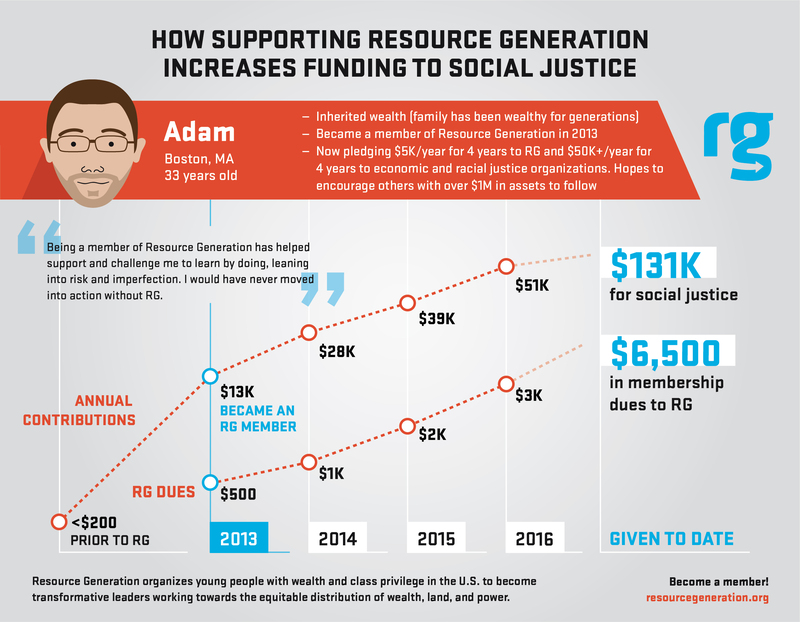 Supporting Resource Generation by becoming a member increases funding to social justice. As a result of having community, unpacking class privilege, and building authentic relationships with frontline activists, our members on average increase their giving to social justice by sixteen-times. A lot of our members have increased their giving way more than that, too. We’re the only organization doing this kind of work in the U.S. to help young people confront and unpack class privilege and organize them around the equitable distribution of wealth, land, and power, not charity. It’s our responsibility as people with privilege to organize other folks with privilege — ensuring that this organization is sustainable through membership dues helps do that and allows our work to be funded by you, not from big grant money that grassroots orgs are applying for. 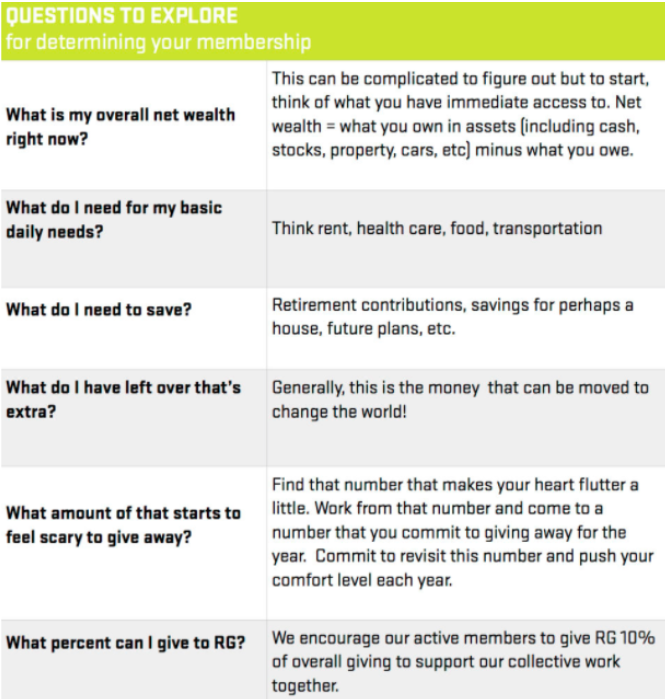 READY TO BECOME A DUES-PAYING MEMBER OF RG? your investment in Resource Generation’s collective commitment to social, economic, and racial justice. Membership-dues start at $250/year, but how much should you give? Check out these charts below. Through stock donation: Please contact Faisal Alam at faisal@resourcegeneration.org. If you encounter technical problems increasing your membership-dues or have any questions, email danielle@resourcegeneration.org with any questions.